Mac plays his last regular season game against Cy Ranch. 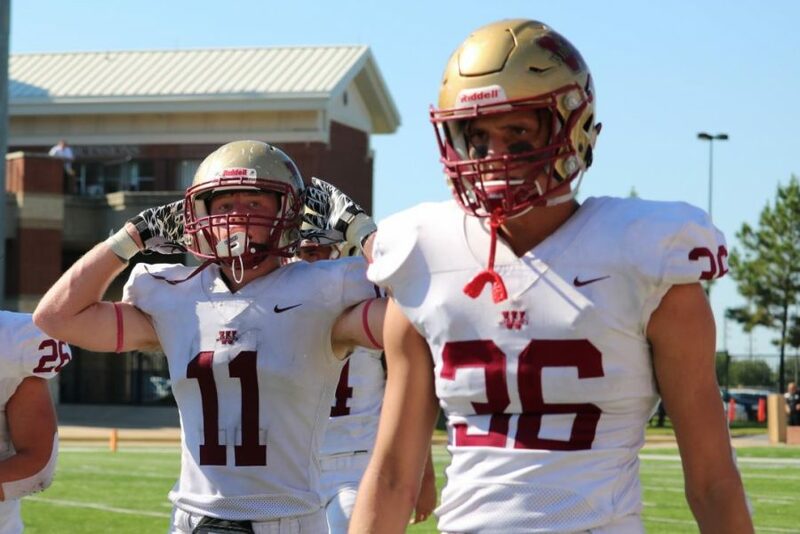 “You will probably never play football again.” Those were the words that senior linebacker Mac Bird was told during his junior season of football. However, a little over a year later, Bird recovered and is now on his way to committing to play college football. This almost career-ending football injury happened during the grueling weeks of Hurricane Harvey cleanup. Bird was cleaning and demoing a house with his fellow friends and church members when a door jam fell onto his leg and a rusty nail punctured his calf. Thinking not much of it, Bird continued to do what he loved, playing the game of football. However, week four of his junior season, that nail would come back to injure him even more. Bird rolled his ankle in the game against Langham Creek, which lead to the beginning of a painful couple months. “I woke up later that night in the middle of the night to excruciating pain in my lower leg,” Bird said. With that night full of pain, Bird went to visit head athletic trainer Luis Villarreal to try and figure out what exactly was wrong. After checking Bird out, Villarreal suspected that Bird may have what’s called Compartment Syndrome, which is when internal swelling causes a buildup of pressure and cuts off circulation to a limb. With that suspicion, Villarreal recommended that Bird to go to the hospital to see a doctor as soon as possible. “[At the hospital,] I was rushed into emergency surgery to relieve the buildup of pressure and allow the blood to flow,” Bird said. Remember that nail that punctured Bird’s calf? Well that rusty nail was cause of this emergency surgery. During surgery, the doctor discovered that the nail that went into Birds leg had then hit an artery in his leg. Later during his stay at the hospital, his doctor informed him that if he had waited a few hours later for the surgery, they would have had to amputate his leg at the knee. The doctor also told Bird that his junior football season was over and his future ability to ever play again was to be determined. With that news came trials and tribulations, but Bird chose to remain positive and look at the bright side of life. While choosing to remain positive, there was no denying that Bird would fall behind in school. With this degree of an injury, Bird was bound to fall behind in school and his extracurriculars. While playing catch up was harder than expected, Bird got his work done in the classroom, and he eventually got caught up with the rest of his peers. Now it was time to pursue physical therapy, and Bird was ready to prove his doctor wrong about never playing football again. Fast forward to August of 2018, Bird had beat the odds, and he was back on the field practicing with his teammates in preparation for the season opener against Cypress Ridge. Bird completed his senior season with five solo tackles and 11 total tackles, and he also caused one forced fumble. Bird would finish his career as a Cy Woods football player by also receiving the acknowledgement of being an Honorable Mention Linebacker for District 14-6A. While Bird’s future is yet to be decided, it is certain that Bird will be serving a mission for the Church of Latter Day Saints. Once Bird returns home from his mission, he hopes to pursue football in college. Whichever college Bird decides to play football for, it is safe to say that that team would be getting an athlete who will never quit and a person who will always see the good, even in bad situations.